The polls following the first ever Party Leaders General Election debate on ITV are showing that Nick Clegg has won a convincing victory over David Cameron and Gordon Brown. 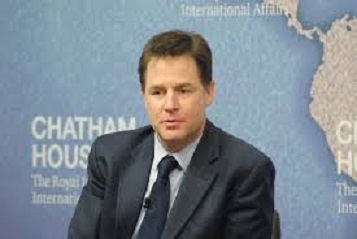 The debate was the first ever Leaders debate during a UK General Election campaign, and the pollsters are giving it as a big victory for Nick Clegg and the Liberal Democrats. YouGov, Channel 4, Guardian, Daily Mail, The Times and Angus Reid polls following the debate also scored Nick Clegg as the clear winner of the first Leaders debate. Angus Reid said that 42% of voters were more likely to vote for the Liberal Democrats as a result of the debate. The Daily Telegraph’s headline following the debate said “Clegg’s star rises in great TV showdown”. The Times comment “Enter the Outsider: Nick Clegg seizes his moment in historic TV debate”. Even Conservative commentator and blogger Iain Dale said “I think Nick Clegg won the day”.